AUSTRALIA has whisked Kangaroo Shaun Higgins from pre-season training onto a plane to Perth to play in Saturday night's Virgin Australia International Rules Series second Test. The 29-year-old's full-time move into North Melbourne's midfield paid huge dividends this year, with him enjoying a career-best year and winning the club's Syd Barker Medal. Higgins averaged 23.5 disposals, 476.9 metres gained, 7.2 score involvements, 5.7 inside 50s, five tackles, 4.4 clearances and still kicked 18 goals in his 21 games. 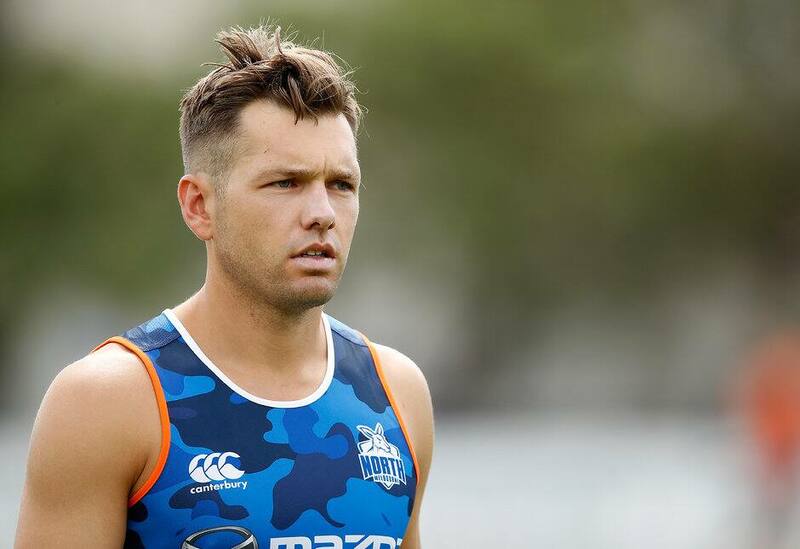 The ex-Western Bulldog, who has played 183 matches since being the No.11 pick in 2005, trained briefly with his clubmates at Arden St on Wednesday morning before heading west. Port Adelaide's All Australian ruckman Paddy Ryder will skip the second Test as part of planned rest, while Collingwood captain Scott Pendlebury (broken finger) has been ruled out. "Shaun has earned his position in the team after being a 2017 Virgin Australia All Australian squad member and winning North Melbourne’s Best and Fairest," Australia coach Chris Scott he said. "We know he will be well suited to the game and I look forward to seeing him play in the Australian guernsey." Original squad member Joel Selwood (ankle) will be fit to play after missing the first Test, which Australia won by 10 points over Ireland in Adelaide on Sunday. Demon Michael Hibberd (calf) is in doubt, but Brisbane Lion Dayne Zorko expects to shake off a minor hip complaint to take his place, too. Ireland also made additions to its squad, with delisted Carlton rookie Ciaran Sheehan and Monaghan's Darren Hughes brought in. Gold Coast dasher Pearce Hanley (broken hand) is a confirmed Irish omission, and Niall Murphy and Enda Smith are racing against time to shake off a virus.